Stainless steel single-stem with side tufts for power tool use. Provides a high degree of fill stiffness with minimal flexing. 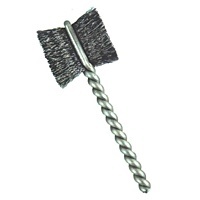 Use for cleaning and polishing inner walls of tubes, cylinders and blind-threaded holes. Option of carbon steel or stainless steel fill material. Can also be used with our side action brush holders >, which slightly reduces fill trim length for a stiffer, more aggressive brush action that can be driven at a higher RPM. 1/4" 5/16" 3/8" 7/16" 1/2" 9/16" 5/8" 3/4" 7/8" 1" 1-1/8" 1-1/4"